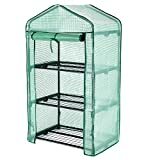 Sonngmics 3-tier Mini Greenhouse is a beautiful landscape in your garden or balcony. It can provide perfect protection for your plants all the time. It can avoid rain, wind, birds and intense sun damage which promoting plant growth. With open shutter type door and zipper design, it’s easy to open, and effectively regulate its temperature. You can also roll up door to take care of plants, such as watering. Space saver 4-layer design with more space for pots, you can put the item anywhere you like. Sonngmics 3-tier Mini Greenhouse must bring more convenient for your life.